These days, I'm not feeling real foundation anymore. The ones I own don't give me enough glow and cling to dry patches, which in turn makes it all look a bit too cakey for my taste. 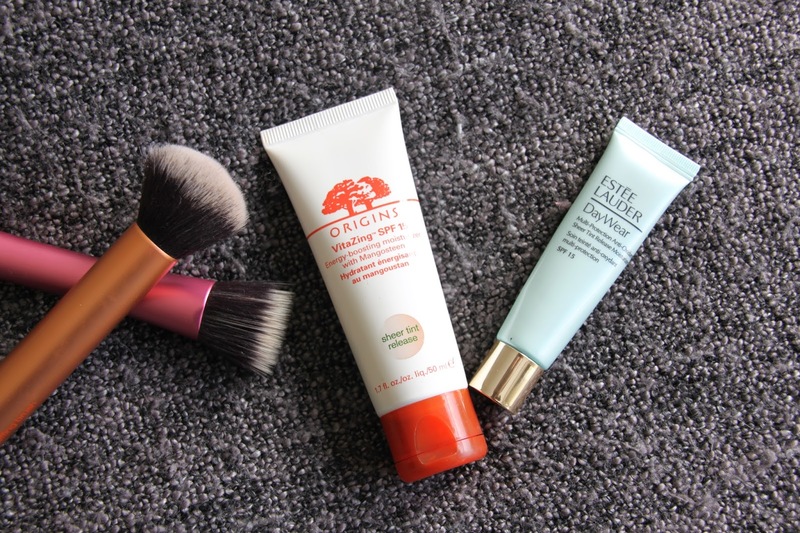 My alternatives are these two, the Origins VitaZing (€ 38.28) and Estée Lauder Daywear Tint (€ 52.80). Both are a grey cream with small particles that burst once you apply them to your face. The particles are supposed to adapt to your skin tone - but really, they react to how much pressure you put on them, more pressure meaning a more intense color. They are my weapon of choice for three reasons : 1) they make for a light coverage; 2) they both seem to give serious glow to my skin, which is what my dry skin aches for; 3) they give just a slight tint to my complexion, making me look less ghost-like. In terms of application, I find that my fingers give too much pressure, bursting the particles more and making the color of the cream just a tad too dark for my fair skin. With a brush, your application is lighter; I either choose my Real Techniques Stippling Brush (for extra light coverage) or Buffing Brush (for light coverage). If I had to pick one of the two, though, I'd go for the Vitazing. It's color is closer to my skin and I find it blends more nicely than the Estée Lauder one. Also, it's less deadly for my purse. Have you tried one of those grey creams with color-adapting particles? What are your favorites?